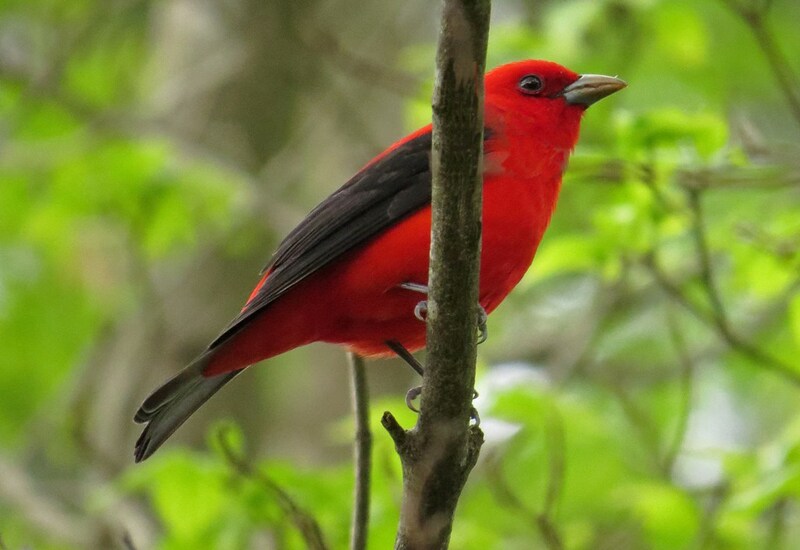 This Scarlet Tanager stopped in for a mere moment. You never know who will show up during the spring migration. This entry was posted in Birds Without Words and tagged beauty, birds, migration, nature, photography, tanager, wildlife. Bookmark the permalink. What a stunning bird Kathy, how blessed you are to have it turn up. What a wonderful capture! I have only sighted a tanager once, but I’m keeping my eyes open. He came by at the same time I was taking pictures of the Red-headed Woodpecker. It was one of my favorite photo sessions! Another one of your avian supermodels, I see! 🙂 Gorgeous, as always, Kathy! Why thank you, “Miss Chatsworth”…(I realize that I don’t know your true identity)…I am hoping a few more migrators make their way through my backyard! What a gorgeous colour. He definitely stands out. Beautiful Kathy. I was so happy he showed up! What a blessing to get one in good range of your camera. We see these birds fairy often in northern Michigan, but they love to hang out at the very top of the tree canopy, making photos nearly impossible! Great shot, once again! He did exactly what you said…perched for a mere moment, and then flew up to the canopy where he disappeared.